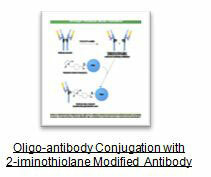 Oligonucleotide-Antibody conjugates have been used in numerous applications from diagnostics to therapeutics. Researchers and assay developers worldwide continue to design new oligonucleotide-antibody conjugates for novel usages on siRNA-antibody delivery in therapeutic applications, vaccines adjuvant or pre-targeting cancer therapeutics. Oligonucleotide-antibody conjugates have been used in immuno-PCR reaction as a sensitive method for protein detection and quantification. Bio-Synthesis offers oligonucleotide synthesis and oligonucleotide-antibody conjugation by combining our expertise in the field and over 30 years of a successful track record. We routinely assist clients in creating antibody-oligo/nucleic acid hybrid molecules using various cross-linking chemistries. 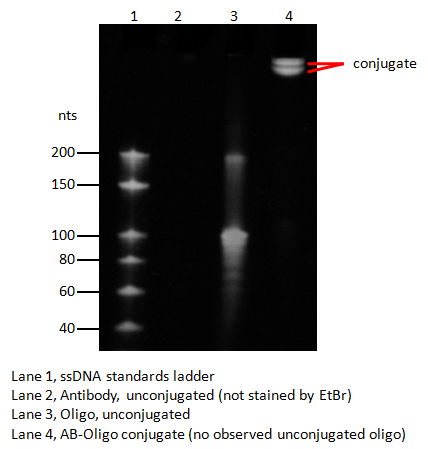 All antibody oligonucleotide conjugates are analyze by SDS-PAGE with less than 10% of unconjugated antibody. Nearly all antibodies are recovered when starting at 2-5 mg/ml in a proper buffer, . Antibody molecules possess a number of functional groups suitable for modification or conjugation purposes. Cross-linking oligonucleotide-antibodies can be achieved through lysine ϵ-amine and N-terminal α-amine groups. Carboxylate groups also may be used to couple with another molecule using the C-terminal end as well as aspartic aid and glutamic acid residues. Although amine and carboxylate groups are as plentiful in antibodies as they are in most proteins, the distribution of these functional groups is nearly uniform on the antibodies’ surface. For this reason, if some of the modified or conjugated residues are located on the antigen binding sites, the method may produce partially active or inactive oligonucleotide-antibody conjugates that may not bind to the antigen. In such cases, an alternative conjugation method using a thiol reactive group by selectively cleaving an antibody with a reducing agent to create two half-antibody molecules, or using smaller antibody fragment such as Fab'. 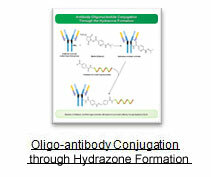 Conjugation done using hinge area-SH groups will orient the attached oligonucleotide away from the antigen binding regions, thus preventing blockage of these sites and preserving activity. The second alternative method of site-directed conjugation of antibody molecules takes place at carbohydrate chains, typically attached to the CH2 domain within the Fc region. Upon periodate oxidation, an aldehyde group can be introduced to the antibody, which will allow it to react with an amine modified oligonucleotide. 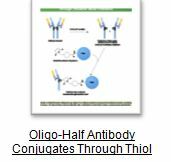 Antibody is reduced at the hinge region to yield two half-antibody molecules, which then react with maleimide-activated oligos. The price varies based on the project specifications. Our service includes materials and labor for conjugation only! Price does not include the cost of biopolymer synthesis or purchase from a commercial vendor. If deemed necessary, biopolymer modification introduce additional functional groups, extra linkers or spacers will be an additional cost. Please contact us for a quote. Up to 3 mgs of starting material and 1-2 mgs of antibody for initial pilot conjugationprior production, is required for a thorough optimization, and method development of purification and analysis. We have been successful with as little as 200 micrograms in some cases. We provide a few test runs for our customers to test.The test conjugates are agreed upon within one week. Bio-Synthesis will also provide a scale up production. After conjugation, a standard desalting, or purification, a small percent of heterogeneous products containing single or multi-site conjugate per molecule. Depending on project specification, a pool of heterogeneous products in a small percentage may exist. Oligo synthesis and modification are manufactured under a strict, quality control process. Analytical HPLC and MS analyses are performed in every development cycle. After activating amine modified-oligos with NHS ester-maleimide, followed by gel filtration to remove excess cross-linking reagents, reduction of the antibody is followed by the conjugation of the antibody to maleimide-activated. Final target conjugates must first be isolated from excess or unreacted reagents. In many cases, simple dialysis removes unreacted reagents from the reaction solution (if the protein/antibody is significantly larger(>3-fold) than the modifying or coupling reagent). Additional purification such as stirred cell filtration, tangential flow filtration (TFF) or gel filtration chromatography may also be used to either remove excess reagents or isolate and characterize the cross-linked product. Reagents that are similar in size or larger than the antibody (mostly protein and other biological molecules) may require other purification techniques such as affinity chromatography, ion-exchange chromatography and hydrophobic interaction chromatography. Cross-linked target molecules may then be further characterized by biochemical or biophysical techniques for an additional fee. Once the product has been purified, it may be subject to many different types of studies including spectroscopic (MALDI-TOF,ESI, LC-MS Fluorescence), electrophoresis, immunochemical biochemical and/or enzymatical analysis. QC (quality control) and QA (quality assurance) procedures are also followed independently to offer you double guarantee for the highest quality possible of every delivered conjugate. Moreover, our dedicated, technical account managers will guide your project through every step of the process, and constantly keep you informed of the latest project progress. We can chemically link the intended components of a conjugated molecule. However, there exists the possibility that the binding sites/active sites of the protein can be altered/modified (partially or completely) independent of the stoichiometry used. Sometimes, this loss of activity is caused by physically blocking the antigen binding sites during conjugation, or by conformational changes in the complement-determining regions. Some proteins/antibodies are just too labile to undergo chemical modification reactions, regardless of the coupling methods used. Bio-Synthesis can only guarantee the structure of our conjugates but not the suitability to specific biological applications.